Today’s live production environments demand cost-effective playback of video, key and audio content. Tria+ is the ultimate production server that provides the flexible, feature-rich, multi-channel capability you need to deliver compelling live programming. Create your ideal configuration. Tria+ offers 4, 8, or 12 symmetrical video channels – meaning every channel is instantly switchable between record and play. Integrated media file import and export tools dramatically streamline file-based workflows. Files are automatically matched to production format on import and the export process features a variety of user-defined parameters. Compatible with the spectrum of resolutions and formats, including Ultra HD-4K, HD and SD. 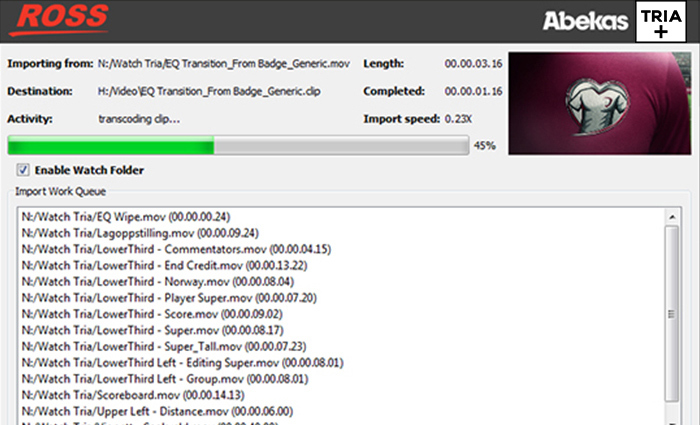 A wide variety of the most popular self-contained media files can be imported and exported with ease. Tria+ “video+key+audio” (VKA) architecture unifies these three media elements into a single clip. 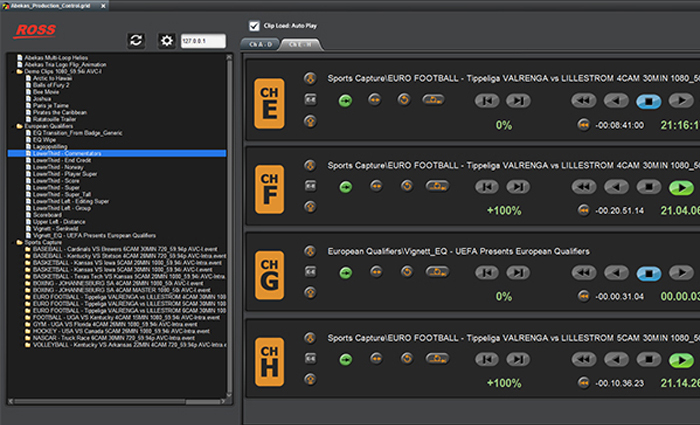 This dramatically simplifies clip management, import/export, and live playout control. An uncluttered and intuitive display of transport controls and real-time monitoring for each video channel. Control software can also be operated from any Windows-based computer on the local network. Quickly and easily share media clips between any number of Tria+ production servers interconnected via Gigabit or 10-Gigabit Ethernet. No matter where a given clip is stored—any clip can be played back in real-time. A flexible, feature-rich, multi-channel production server that delivers the creative freedom you need—at a price your budget demands. The Software Transcoder imports media files without the use of a video channel, allowing you to dedicate all your server’s channels to live recording and playout tasks. This powerful feature can be deployed while capturing one or more live video sources. It works by writing a continuously growing MXF media file for each live recording stream onto external network attached storage (NAS) – including one of the affordable Ross EVO Signature Series storage solutions. From there, edit systems capable of editing with growing source files can begin using these files, even while live capture is still underway. This streamlined live editing workflow save both time and money; and gets your finished productions to air faster than ever before!